Have you ever had 16 bean soup? Most often 16 bean soup has ham in it. Well let me tell you, my husband and I HATE ham. It’s so bad, on Easter we make our decision about which side of the family to visit based on who ISN’T having ham. Not sure how we ended up together, because I think we’re the only 2 people in the world I know who don’t like ham? I guess we ARE soul mates. Anyways, a couple of years ago I decided I wanted to use the 45 bag of 16 bean soup mix I bought but was pretty distraught when I realized a lot of the recipes I found had ham in it. Not to mention, in a situation where you would have to live off your Food Storage ham maybe wouldn’t be that available. After tweaking the recipe around a number of times, I’ve found something we really like and we eat it a few times a month. Eating beans is so good for you, and this mix has such a variety of legumes in it, that it makes it so tasty, and healthy! Learn more about legumes on our BabyStep 6 Page. Also more specifically about beans here. If you’re a little anxious about cooking dry beans, you are not alone. Read about Julie’s multiple failures with cooking beans in this post. 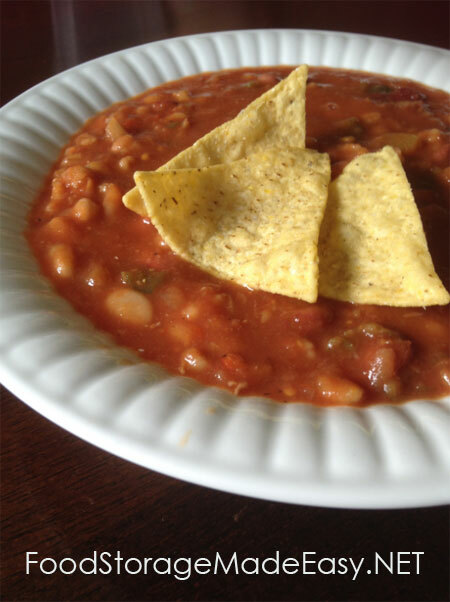 Cook the beans in a pressure cooker, or in a crock pot. I use my electric pressure cooker and cook them on high pressure with natural release, for 45 minutes if I have soaked the beans for a number of hours. If I’m making a last minute meal and didn’t soak the beans, I cook them for 52 minutes. If you’re cooking the beans in a crock pot, cook on low for 6-10 hours. Do not add salt to uncooked beans – it will slow down the cooking process. Also the cooking time can vary based on how old your beans are.